Business leaders and organization directors are typically adept at handling pressure. It’s part of the job description. But many of them break into a cold sweat when asked to conduct a media interview. Chatting with a reporter or talking into a camera is not in their comfort zone – whether they’re out there defending a negative situation or even just promoting a good cause. That’s why one service Ceisler Media & Issue Advocacy offers our clients is media training. We want them to learn that talking to the media does not have to be an intimidating experience. Typically, our training sessions comprise small groups, between two and four people. But at this year’s annual conference of the Pennsylvania Health Care Association (PHCA) our Senior Director Kirk Dorn and Managing Director Kurt Knaus spoke to 400 attendees, mostly administrators of nursing home and assisted living centers. One big message: Most media encounters are non-threatening. In fact, they usually offer opportunities to promote your organization. We realize that many of the people attending our sessions want nothing to do with media if they can avoid it. So we aim to help them understand how beneficial a proactive media campaign can be in building their company’s reputation. Let us give you an example. Our client, the Housing Alliance of Pennsylvania has been doing excellent work for years on issues of affordable housing legislation. But not enough people knew it. We worked with them to create a statewide media campaign, and now they are rightly regarded as a go-to source for information. The training at this particular conference focused on facilities that are highly regulated and might attract media scrutiny. Certainly, a questionable report from the state citing issues at a nursing center will raise a reporter’s eyebrows. And that can lead to pointed questions. That’s where an executive’s handling of a challenging interview becomes crucial. The difference between a fair story and a damaging one often lies in how an organization presents itself and its facts, the manner in which it answers questions and even the demeanor of the spokesperson. Sometimes you can even find a way to promote the great work your organization does while defending yourself against a negative narrative. 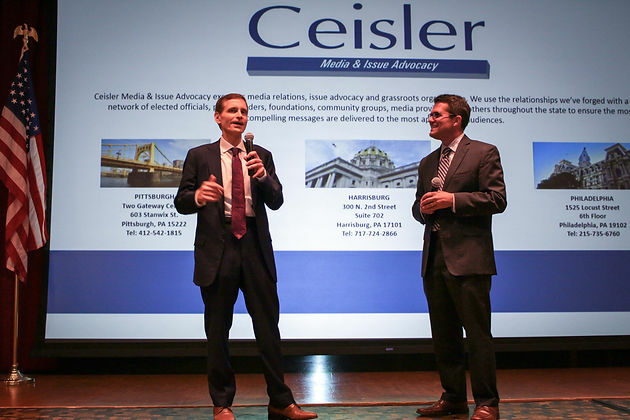 Ceisler Media conducts media training for clients ranging from large corporations to small nonprofits. No matter their size, the first imperative is always the same: Preparation. You need to anticipate all the questions you’ll face and ready yourself for how to answer them. Ultimately, your success boils down to how well you’ve prepared. Because most of our training is for ongoing clients, we help develop their key messages and talking points and then practice with them after the initial training. Another big lesson we impart is the need for honesty. You use the best facts you have and assemble them into your best argument. Often, the smart strategy is to use a reporter’s tough questions as a springboard to present your facts. Both of us worked many years in media and government communications before joining Ceisler Media. So we bring perspectives and experiences that cover virtually every situation our clients might encounter. One nursing center network CEO we work with was initially afraid to deal with the media. Turns out, he was a natural who performed brilliantly after some training. Now that CEO welcomes the chance to meet with reporters – when it makes strategic sense. At this recent media training session, like most, we ended by conducting mock interviews. We videotaped clients answering questions from “reporters,” and then let them watch and critique themselves. It was a rewarding experience – interrupted only by the opening of the martini bar. As productive a session as we put on, we knew we couldn’t compete with that.